Suddenly, everything changes. Sumac has to give up her room to make the newcomer feel at home. She tries to be nice, but prickly Grumps clearly disapproves of how the Lotterys live: whole grains, strange vegetables, rescue pets, a multicultural household... He's worse than just tough to get along with -- Grumps has got to go. But can Sumac help him find a home where he belongs? Now Sumac Lottery (age nine) is the fifth of seven kids, all named after trees. With their four parents and five pets they fit perfectly in the Toronto home they call Camelottery. But the one thing in life that never changes... is that sooner or later things change. All together it sounds great. 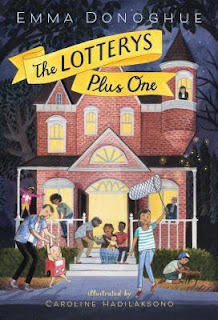 Add your review of "The Lotterys Plus One" in comments!